This duo (Saffio – keyboards and programming, Chem:nitz – vocals) comes from Rome, Italy, and formed in 2005. They’ve already released two demos (S/T 2005, "The Shining Process" 2006), have appeared on the German Darklife Magazine Compilation and on "Italian Body Music Vol.3". The band is really in love with Electro-Goth/EBM and Dark-Wave, and in this new Ep alternates moments of sad reflection, dominated by deep and visionary pads, with aggressive loops, distorted voices and noises. They are quite good in this alternation between good and evil, CLAN OF XYMOX influences and painful atmospheres, horrorific melodies (see "Your Wintertime") and danceable songs for smoky clubs. Personally I’ve quite appreciates "I Run For... ", "Your Wintertime", "A Prison For Me" and above all "The Blind Creation" (great track) with that obsessive rhythm that forces me to shake my head even when writing this review. "Sermons" has a rough and fat music (shows more links with the EBM scene), and the vocal melody reminds me something of AND ONE. "Blessed Into Nothing", from "The Shining Process" demo, is here in a new version remixed by NYDHOG (a one-man project from Rome playing Electro/EBM with really good results), where the aggressive side of the song is emphasized, as more emphasis has been given to the female coir. The CD includes also two videos, "I Run For... " directed by Saffio and "Tonight" directed by Saffio and Jon Alcaide, a nice add on to a very pleasant Ep. The only thing I could add is that the band is really improving from demo to demo, and in their first album (hope they’ll release soon with a good label) I would expect an even better production (already good now), more pumping and powerful in the aggressive parts and deeper in the more introspective ones, and above all that the singer takes care of the English pronunciation that has some problems, as shown in the live acts more than on recordings. Labels, offer them a good contract because "Metropolights" it’s a very good work, absolutely recommended for all old-school/new-school electro-goth fans. 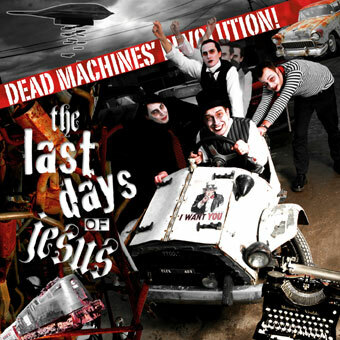 THE LAST DAYS OF JESUS: Dead Machines' Revolution! I knew The Last Days Of Jesus because of their MCD "Narrentanz" released back in 1999. Since then I appreciated their attitude of taking the batcave/post punk sound and making it evolve into something personal and energetic. Since then I haven't the opportunity to check their releases until now. DEAD MACHINES' REVOLUTION! confirms my positive feeling I had back then as on this album we find Mary0 and friends performing 13 tracks of personal gothic rock where the theatrical vocal performance of Mary0 are well supported by the music of the band. Post punk, goth and new wave are revived by the quartet which along with their label mates Miguel & The Living Dead (I saw they live in Italy about a year ago) are doing a great job by breaking old cliches of goth by including also some r'n'r/rockabilly influences. Started by Dr. No in 1995 Black Horizon had to wait until 2002 to have their debut album released. "Infinity of chaos" was released by Transmission Records where the Dr. No worked for that label but wasn't allowed to released that work by himself . He was satisfied by the selling but he decided to expand the project toward a new way of communicating. For this reason he created the DVD SPECULUM ANIMAE and he decided to share part of it for free through his website. The DVD contains two new albums "Vitrum" and "Aqua" along with visual for each track of both of them. The first presents the band's sound as a blend of goth industrial metal where you can find influences that easily go to Sister Of Mercy to Pitch Shifter passing through N.I.N. and Ministry. You have the option to have the vocals in Dutch or in English and the can also have both the languages subtitles. The digital animation and all the live shootings have been made by Dr. No and they are able to create the right mood for the listening of the album. "Aqua", as the title can make think, has a different sound/visual and presents reflexive tracks with ambient/space rock parts as well as a little of new wave/industrial. The DVD is based on a story written by Mr. No titled "The mirror of soul". It talks about two persons of different planets who have their lives linked and they influence each other existence without knowing it. Marlahana and Nomade will discover little by little that they were made for each other. Nomade will be helped by Marlahana into his search of the ultimate congruence. There's also an extra 7 minutes film which comment this part of the story. Visit Black Horizon website and experience a little part of this gigantic piece of work.